The dialogue around sexual harrassment the past few months that began with revelations about movie mogul Harvey Weinstein is a watershed moment in this country's history. Harassment allegations have touched all industries from media, with morning news anchors Charlie Rose and Matt Lauer fired; government, with members of Congress, including Senator Al Franken resigning; and continued this weekend with multiple allegations against Las Vegas casino magnate Steve Wynn. With all these horror stories has come a conversation among thoughtful men and women about how to move forward and how they can solve this problem together. That's What She Said is a clarion call from veteran journalist Joanne Lipman, who argues men can and must join the conversation to close the gender gap. She offers steps that men can take right now alongside women to move toward a solution. world. We're adjusting to you, every day. The more intriguing notion to me, though, is that men are starting to meet us halfway. They're recalibrating their behavior, just as we recalibrate ours. And in doing so, they are transforming a one-sided conversation - women, talking to and about women - into something far more powerful. When men and women both reach across the gender divide, we actually will have a shot at closing the gender gap." Lipman broadens the conversation beyond the current focus on sexual harassment to examine the crisis in our wider workplace culture. Not every woman has been sexually assaulted, but most every woman knows what it feels like to be marginalized, interrupted, or overlooked at work. Every woman has siffered from the respect gap and knows what it feels like to be invisible or for her ideas to be disregarded until they are repeated by a man who ultimately takes the credit. One clear point from Lipman is that men and women don't understand each other when it comes to equality in the workplace. She writes, "Despite the decades that men and women have been working together, we still haven't quite figured each other out. Men, even the most enlightened of them, often remain oblivious to the issues facing their female colleagues in the next cubicle. It's no wonder. They've grown up with the concept that 'equal' at work has meant 'the same' - a notion that has done us all a disservice. It doesn't allow for the many differences that may inadvertently reward men while punishing women. It smooths over and ultimately negates the challenges that women face every day, which in turn makes their experiences invisible to men. Lipman identifies the issues that have propagated an environment of discrimination and harassment, including unconscious bias, "bropropriation," the respect gap, "mansplaining," the gender wage gap and much more - and clearly explains how to remedy these behaviors so that women can finally feel empowered at work. 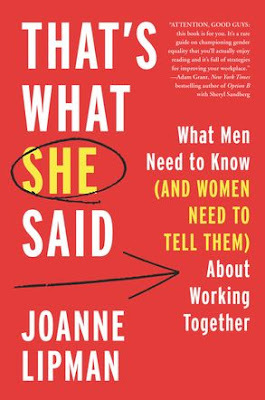 Based on her explosive Wall Street Journal article Women at Work: A Guide for Men, Lipman expands on her celebrated, accessible approach. That's What She Said is filled with illuminating anecdotes, including a conversation with a businessman on a plane to Des Moines that enlightened her thoughts on the gender gap and men's perspective. Putting words into action, she demonstrates the possible benefits to business that can abolish the gender divide, and the workplace success both women and men and can enjoy by working together toward this pivotal goal. Lipman presents her argument in a straight-forward manner that makes this book well worth reading.